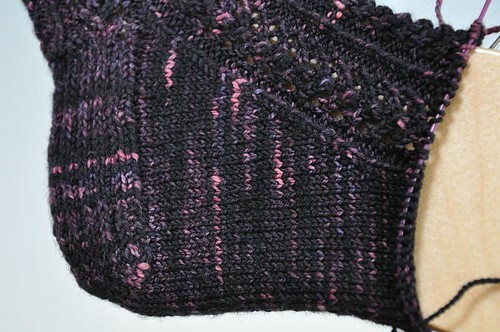 That’s the pattern where I learned the “knit through the back loop” method for twisting those gusset stitches closed. It’s a nice trick, and even looks pretty cool as a texture stitch! Both are really pretty. The second version is far nicer though. Your socks are going to be stunning! Oh I hate when that happens, my biggest problem are the words “and at the same time.” I’m glad you didn’t give up on the sweater, sometimes we are our own worst critics. i liked the ‘wrong’ version too. I had never seen it done before and thought, oh! How nice is that? There must be something magical about the combination of Hedera + train. Because I’m almost to the toe of Sock #2, and pulled it out to compare with the first one…only then did I realize that one sock has a slipped-stitch heel, the other has an eye-of-partridge. D’oh! So frustrating isn’t it when it’s a mistake that you could have avoided? I think it looks great either way. but you will never see it! I love the alternate version – no way would I frog it!! You are funny! But I also happily wear matching but not handknit socks, so maybe that’s just me!! I used to try and reign in my perfectionist tendancies with knitting, but it doesn’t work so I know what you mean! They are very nice socks too. I sort of like the wrong version – but I probably would have done the second sock the same way! But – you have to be happy with what you knit, so I can understand frogging it. 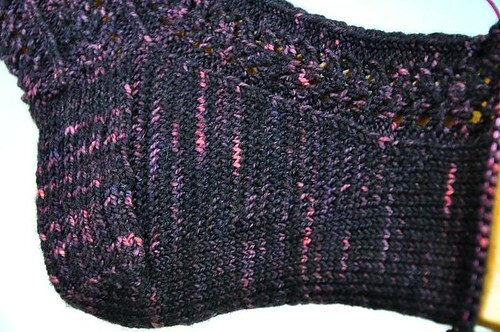 Hope you finish them soon – it really is a pretty sock.